My new Necromunda gang is finished! Ironically, this comes after I sold my old Necromunda gang and on the very day the eBay auction ended, Luke announced "There shall be a NEW Necromunda campaign" after he quite spectacularly failed to keep the last one going. Cue James and Simon bursting into fits of laughter having told them earlier that day how much money I'd made from the eBay sale. As Necromunda models are now stupidly expensive (nice one GW! ), I decided to order some Space Marine Scouts and convert them into a Van Saar gang using Elysian Drop Troop heads from Forgeworld. I've used my Tau colours to paint them, copying the Master Chief's colour scheme from Halo for something a bit different. My new Necromunda gang are called The Plasmongers due to their hunger for all things plasma. Mostly just plasma guns. There are 5 plasma guns in total (I'm relying on the 'specialist' skill) plenty of shotguns, a juve to bite bullets and a Heavy armed with a heavy bolter. I never expect to field them. In truth, I never expect for us to play Necromunda ever again because it turned into one massive cheese fest. Even when we had to work together to complete missions, there was so much back stabbing, double crossing and general cowardice that it was much harder than it needed to be. Our competitive natures developed from playing Warhammer 40K really ruined Necromunda for us. Back in the day it was brilliant fun, even if Luke's Van Saar gang won every game. Come to think of it, it was Luke's Van Saar gang which started the cheese war and that damned Ballistic Skill 6 Ganger armed with a needle rifle and a scope. The the two Heavies with heavy bolter emerged and a leader with a plasma gun for anyone who got too close. As much as I truly, in my heart, love Necromunda and have many great memories of shoot outs, bank robberies, running from the Adeptus Arbites and being eaten by zombies, you need someone to constantly bring balance to a campaign, keep things interesting and create a story. 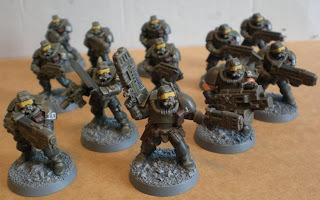 Unfortunately, we just don't have time now that we're all decorating houses, dating women, working our arses off in our careers and doing our best to fit in some games of Warhammer 40K, let alone actual paint our armies. My favourite games were Necromunda and Mordhiem, the synergy of RPG and tabletop in them was just perfect, but now I'm lucky if i can get a 40k game in in a month, much less a campaign. Shame, but I hear ya. I started out with my GW plasti-crack habit on Necromunda, now I cant remember the last time I played a game... I even bought the new models when it was re- released hoping to get back into it, but no, not a single game played with the new edition. It's been forever since I've played Necromunda. You're gang is quite awesome. I've been looking to mix Necromunda with Infinity for a while now. These would be a great way to build something for that. thanks for the inspiration. One thing I have tried that can help with getting Necromunda interest is to play 40k on the scenery that comes with the necro box. My old uni games society had about three sets of it and we made an awesome multi-level cityscape through which ~6000 points of marines and Tau took on Chaos and Necrons. A few rules tweaks to make it easier for moving squads (2" movement per ladder, if 1/2 can make it up, the whole squad can) and you have a great game. It feel more justified that everyone gets a cover save that way too. In any event, perhaps you can interest your buddies in a few gang battles on the same scenery, perhaps to loot the wreckage leftover after the 30k battle.